As a spiritual heir to the International Space Station (ISC), this village will serve as the basis for astronaut teams to conduct vital research and experiments . In recent years, some very interesting proposals have been presented as part of this plan, the latest being the ESA's European Astronautics Center (EAC) where a student team has developed a proposal for a sustainable moon habitat. Head of the team is Angelus Chrysovalantis Alfatzis, an architecture student in his last year at the National Technical University of Athens, Greece. He and his colleagues are only part of the many young researchers participating in Spaceship EAC – an initiative of ESA to promote networking and collaboration with universities and research institutions across Europe. Alfatzis and his colleagues developed their concept of the Moon Base for the NewSpace2060 International Moon 2018, a joint initiative with the Moon Village Association, which was held in the autumn of 2018. Architectural concept and category of the publication, where participants were encouraged to come up with ideas to work with existing technology and knowledge of the Moon. Alfatzis describes his architectural approach as "hyperlocal", which uses the concept of site resource utilization (ISRU) to create sustainable living solutions for extreme environments in remote locations. As he explains his vision in ESA's recent press release: "I always strive to find tangible and structural solutions in line with available resources on the ground. At the moment, my focus is on the use of untreated moon soil for construction and architectural applications of this. This focus is in line with the objectives of ESA to create an International Village of the Moon, which requires the use of local resources not only to produce the base but also to take care of the needs of the crew. Working together with others in the Spaceship EAC initiative, Alfatzis and his teammates invented a concept called CORE (Crater Outpost for Research and Research). The CORE concept requires a modular design that uses its own geography and regroit on the moon to protect against the elements. The team chose the South Pole-Aitken Basin as a place on its base, which offers the advantages of stable lighting, easy communications with the Earth and proximity to water ice. Each module will consist of an inflatable, prefabricated structure with its own life support system and a central tube. In this way, the modules can be positioned vertically, one on top of the other, while allowing transportation between them. As Alfatsis explains: "Our idea is to transport the inflatable modules to the base of a small crater in the Southern Polar Area of ​​the Moon and then gradually fill the cavity with moon soil until the modules are effectively buried. The shielding meters will protect from radiation. The building inside the crater will also help isolate it due to the stable temperature of the underground environment of the Moon and will provide coverage from the threat of micrometeorides. The plan also requires an airbag module to be added to the top of a structure, which will then be covered with more regolith to provide protection. Inside this air cushion will be kept extra equipment (EVA), and the lunar dust will be softened by an electromagnetic cleaning device that will take advantage of the magnetic properties of regolith to collect it. Vertical modules will be connected to a centrally located elevator. The first module to the surface will house the waste treatment facilities and will be where astronauts prepare for EVA and surface missions. The middle module will be for research and communications, while the bottom module will contain bed pods, living quarters and a training facility (aka "lunar gym"). As Alfassis notes in the video that is part of their entry team, another advantage of CORE design is the ability to extend it to neighboring craters. "The chosen location allows further installation of modules to be delivered and created, creating a real settlement of habitats in nearby homes," he said. 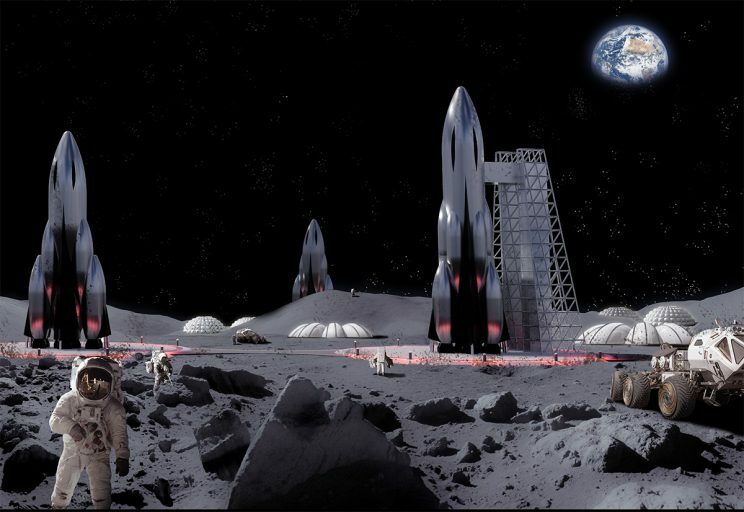 "Realizing the Moon Village is an important step for sustainable human exploration." These include the absence of a breathing atmosphere, the extremes of temperature, the type the terrain and the low gravity of the moon – which is about 16.5% of that on Earth. The absence of a protective magnetic field also means that each moon base should also be able to protect its inhabitants from solar and cosmic radiation, not to mention the small meteorites that regularly float on the surface. For his concept, Alfatzis the Spacecraft team was awarded second place. As Alfatzis pointed out, their success was due to the diverse talents their team presented at the table: "The multidisciplinary nature of our team, from aerospace engineers to biologists, has helped us look at all the different details of building and energy requirements. The whole experience has led us to think more deeply about the different aspects of lunar construction and dwelling, showing us many different possibilities for our future on the Moon. " At present, ESA, CNSA, Roscosmos and NASA all hope to build a lunar post by the end of the 2020s or early 30s. It is likely that this base will be the result of cooperation between these and other agencies, all of which will benefit from the existence of a permanent research base that will help facilitate future missions to Mars and other locations in the solar system.